Like many another occupant of an old cottage, we often wished we could people ours in thought with its inhabitants of olden days, but it seemed that our ‘Thatch End’ would not yield up its secrets. Yet some of its story was there for the seeking, and readers may like to know what I have found and how I found it. The village historian will have collected a mass of records from many sources. 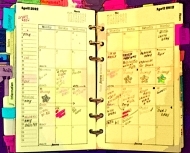 Some of these may convey little information, but now and then a new source is tapped, and quite a lot of the items suddenly fall into a connected story. I have had just such an experience concerning Edburton. Recently the Sussex Archaeological Society published a complete list of the deeds in its possession. Several of these referred to Edburton and some of them I had not seen. 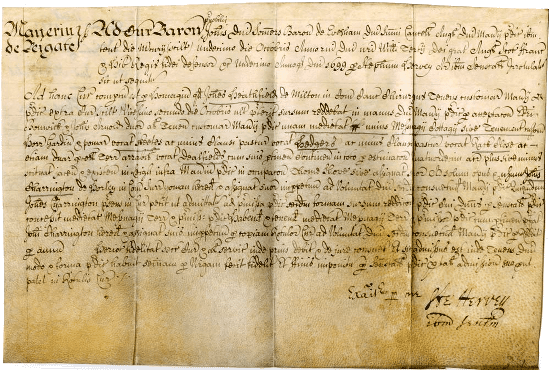 They proved to include nine deeds relating to the transfer of a copyhold property referred to first in 1734 as a “messuage, garden and lands, late Gilberts in Aberton” and in later deeds as “late Rhoades” (or Rhodes). The place was evidently described, as places still often are, by the names of the owners, as we should say “Gilberts” house or “Rhode’s cottage”. The earliest of the set of deeds to which I have referred is a court roll for Gilberts, dated 1734, when the copyholder, Thomas Street, died and left the property to his widow, Anne, and on her death to their son Thomas. The roll satisfied this and “admits” the new owners to possession. After Thomas Street, a roll or more is missing, and the next surviving roll shows the occupant as George Barber, who died in 1780 and left the property to his married daughter Hannah Marshall. We can now begin to people ‘Gilberts or Rhodes’ with real people, for the parish registers came to our aid, telling us that “George Barber was buried Sep ye 8th (1780) aged 93 and had been 57 years clerk to this parish”. As for Hannah, she had been the central figure in a pretty village scandal. When she was nineteen years old she had become the mother of Isaac, whose father was named Friend, and for this she had done public penance in the church. Not only was she the daughter of the parish clerk, but the Friend family was prominent in the parish; one of them had been churchwarden and perhaps was so still; however, Hannah became a sober housewife by marriage with William Marshall, to whom she bore five children. The next rolls show Hannah’s eldest son, William, inheriting the property on her death in 1790, and he in turn leaving at his death in 1819 to his sister Ann, who had married Thomas Lee of Bletchingly in Surrey. She at once sold it to George Marshall, wheelwright, of Poynings, for eighty pounds. The last roll of this series shows it passing when George died in 1839 to his daughter Susan, wife of Thomas Walls a confectioner of Brighton. Here arises a difficulty, for there is a parallel set of rolls concerning the descent of “a customary messuage or tenement, garden, lands and premises late Rhode’s, and theretofore Gilbert’s”, through three generations of the family of Gallup. On the evidence of these rolls this property passed to John Gallup in 1789, and on his death in 1797 to his grandson, John, an infant, in the guardianship of the boy’s father William. In 1819 this property, like Ann Lee’s, passed to George Marshall. Both the 1819 rolls bear the same date, 21st January, so we may assume that Marshall bought both properties. The most reasonable explanation is that this second property was the second (middle) cottage, added in the eighteenth century to the older one at the north end, which was Barters. So far, so good, but where was “Rhodes, formerly Gilberts”. The parish registers tell us nothing and the copyhold rolls do not specify, until, indeed, one of the 1819 pair gives a hint. The admission of Susan Walls was to the messuage in Edburton adjoining the churchyard, and this leads to the third source, the tithe award of 1841. 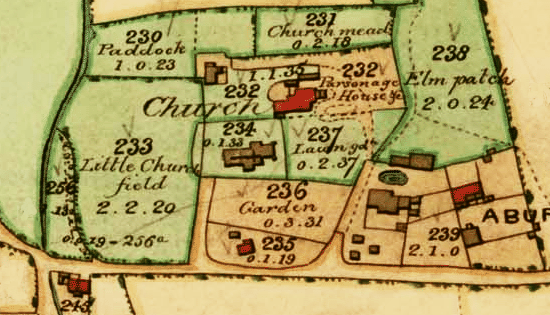 This is a detailed assessment of the tithe due from every field and property in the parish, and it is accompanied by a map [see above] in which every property is numbered. George Marshall is shown as the owner of Nos. 235 and 236. He had in fact died in 1839, so presumably the data for the tithe award had been collected before 1841 and not corrected. Reference to the map showed the property to be three cottages known in my time as Thatch End or the rectory cottage, and its garden. The very place I had lived in myself for nearly six years! Plot 235 contained the three cottages, separately occupied by John Holding, William Mawley and Thomas Parker. No. 236, the northern part of the site, was separately held by James Cuttress, and is described as “garden”. Maps of a later date show this section hedged off from the cottage end, and the line of this hedge can still be made out. The eastern elevation of Rectory Cottage, c1900. Its origin as a terrace of three cottages each built at a different time is rather evident from the wall. So now the shades of past characters move about the cottages. Of Gilberts we know nothing, but Edward Rhodes lived there before 1700 with Alice his wife, their daughter Elizabeth and their two sons who went away as apprentices, Edward, born in 1692, and bound for seven years to a cordwainer at Lewes, and William, born in 1695, bound in 1721 to a carpenter at Woodmancote. Elizabeth married Nicholas Turner but died in childbirth in 1721 and was buried at Edburton. Next we can see George Barber, the nonagenarian, with his wife Frances and the unfortunate Hannah and her husband and children, and Hannah returning home in her widowhood to live with her son William until she died at the ripe age of seventy-two. While these lived their lives in the oldest cottage, next door in the newer, but still ancient second cottage, old John Gallop saw his daughter married to a Woodmancote shoemaker, and when he died, we see his son William caring for his young son, another John, whose house by now it was, and how that William became Churchwarden (1802-1804), how he lost his wife and married again, and at last was laid to rest in 1831 at the age of 75 in the grave nearest the south porch of the church, where, as the headstone still enigmatically announces, “on either side lieth the remains of each of his two former wives”. 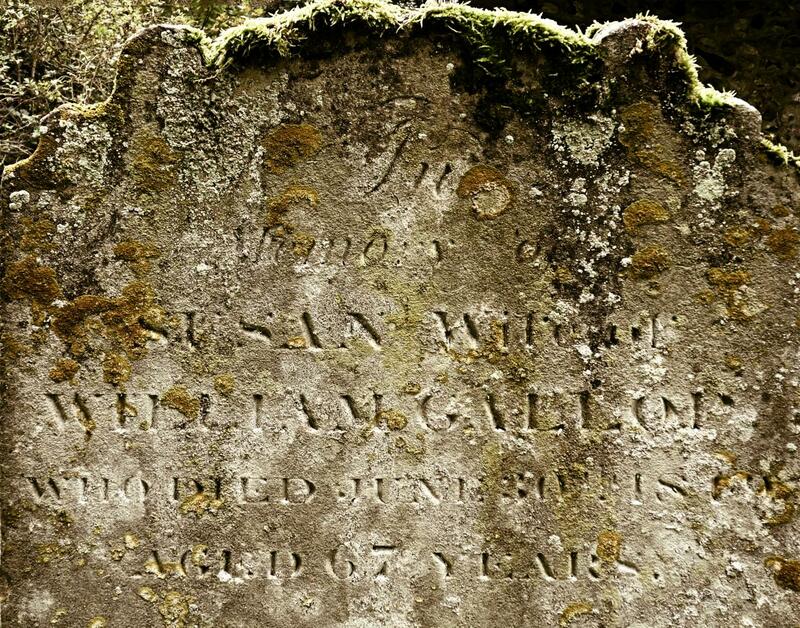 ‘In memory of Susan, widow of William Gallop, who died 30th June 1849 aged 67 years’ — gravestone in Edburton churchyard, right of porch. As a last scene, we see James Cuttress who, as a boy of seven years, had been threatened with a horsewhipping for letting some sheep wander, tilling his patch where now is the top of the garden. Members of the Barber family were still living in the parish a century later. This headstone had either disappeared or become illegible by 1991 when Joan Harris compiled the Edburton graves ledger. 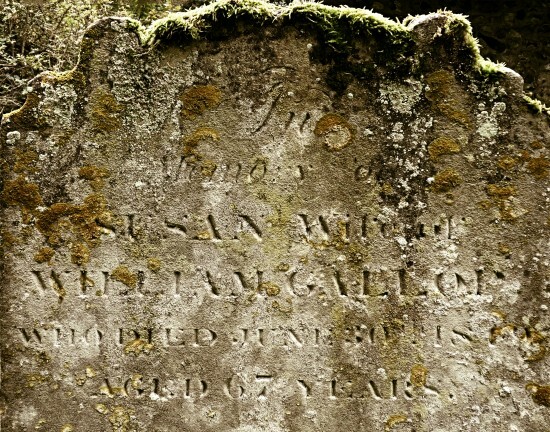 Howe does not remark on how truly strange the inscription is: William Gallop’s widow was to outlive him by eighteen years. The inscription must have been added to his stone after her death in 1849. But by whose instruction? I am 46 years of age. I used to tend sheep for Mr. Goddard, tenant of Robert’s farm. I was then seven years old. I tended them in Fulking Lane. They went out into Holmbush Lane. Mr. Charles Marchant saw them, drove them back and threatened to horsewhip me. He said it was out of Fulking Parish and they should not go there. He then occupied Brooklands which is half in Woodmancote. Thus, at the beginning of the nineteenth century, were small children exploited. Joan Harris (1991) Monumental Inscriptions, The Parish Church of St. Andrew, Edburton, West Sussex. Lewes: Sussex Family History Group. F.A. Howe (1956) “Rhodes formerly Gilberts”, St. Andrew’s Quarterly 32 (October). F.A. 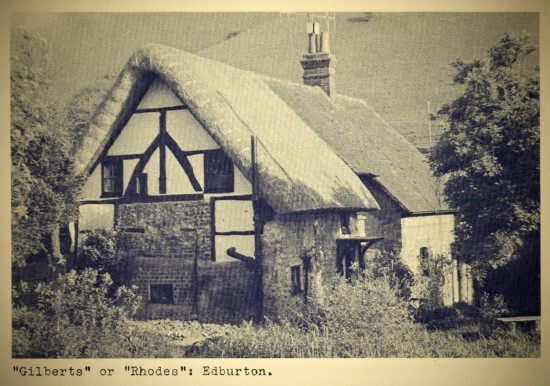 Howe (1958) A Chronicle of Edburton and Fulking in the County of Sussex. Crawley: Hubners Ltd, pages 29, 33-36, 101. This entry was posted in Edburton, Local History, Topography. Bookmark the permalink.